COMPACT BABY STROLLER ORGANIZER with bag and console tray for pram. 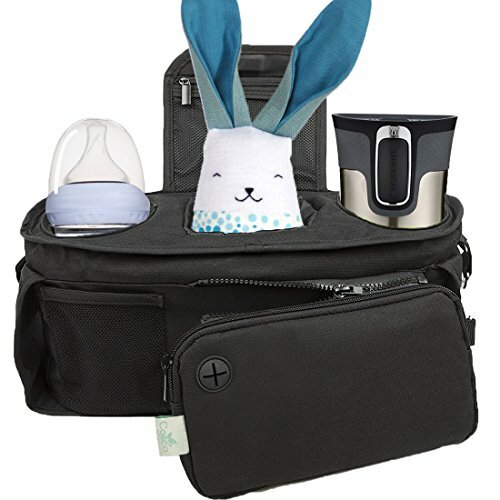 It has lots of convenient pockets and compartments to hold everything from bottles to coffee cups to money, ID, and phone and extra diaper. There is a place for everything Mom and/or Dad will need to stash items and supplies. Just right for taking the stroller out for walks, jogs, shopping trips, or to visit friends and Grandma. EXTRA ZIPPERED POUCH uses a smooth, durable zipper to attach to the bag. Then unzip to take the bag with you. Just right for keeping your wallet, credit cards, ID and more. No more having to stuff items in and around baby inside the stroller. No more losing things that fall out of the stroller basket. Keeps everything close and within reach where you can see and get to it quickly. This is much more convenient and secure. SAFE, MADE WITH PREMIUM MATERIALS with no toxins, harsh chemical additives, or harmful impurities. This product is meant for adult use. Safe for use around baby, children, and pets. It installs in just seconds on any stroller. Now you've got a smart way to carry supplies, possessions, and accessories. 100% MONEY BACK GUARANTEE ensures this will be your best bet for a pleasing no-risk purchase. Many customers like it so much they return to buy another to share with a friend. HURRY AND BUY NOW while we have a new shipment in stock. This makes a much appreciated gift for friends, family, and co-workers - anyone who wants a superior design organizer for their baby stroller! * ULTIMATE STROLLER ORGANIZER smartly designed by parents. It has exactly what you need for staying organized on walks, outings, shopping trips. It has a place for everything including money, sunglasses, phone, ID, bottle, coffee, water bottle, small toy, spare diaper and much more. You will wonder how you lived without this! * DURABLE RUGGED NYLON construction makes this wear well through years of use and several children. It is moisture resistant to keep your items dry inside. Lots of variation and options with different compartments, mesh pouch for phone or other possessions, smooth operating zipper and more. You will appreciate the quality every time you use this organizer. * SEPARATE ZIPPERED POUCH to hold credit cards, ID, medical card, snacks, and more. The pouch zips to the organizer, then unzip to take with you. Very convenient when you need to leave the stroller outside while you take your baby into a store to shop. Very nice touch that makes this compact organizer much more versatile. * FITS ANY STROLLER and installs in just seconds. Comes with complete easy to use instructions. You no longer have to find places next to baby to stuff bottles, wallet, sunglasses. The cargo baskets on strollers are notorious for letting things fall out and get lost. Keep your valued items secure and within easy reach with this premium baby stroller organizer. * 100% MONEY BACK GUARANTEE ensures this will quickly become your favorite no-risk purchase. Many people are stocking up with 2 or 3 to share with friends and family. HURRY AND BUY NOW while we have this very poplar baby stroller accessory in plentiful supply. It is selling quickly. This makes a thoughtful baby shower gift, birthday gift, holiday present, or anniversary gift - great for anyone with a baby or toddler! If you have any questions about this product by Colico, contact us by completing and submitting the form below. If you are looking for a specif part number, please include it with your message.